Most of us have mixed emotions about birthdays. Either we’re trying to minimize the hoopla over our own passing of years or making extravagant events over the annual birthday milestones of our children. Nearly every occurrence, though, involves cake. And let’s face it, every event is simply better with cake. 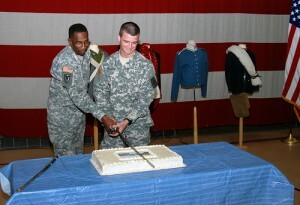 Earlier this month, as Americans marked Flag Day on June 14, here in the New York National Guard we also noted the date as the birthday of the American Army. The Army traces its roots back 237 years to the Continental Congress authorizing the formation of the first Continental Army, a collection of local militias then keeping the British bottled up in Boston in the spring of 1775. The new Army would be led by a former militia colonel from Virginia, George Washington. The great lesson for Public Relations practitioners is to make these milestones or celebrations an event to better tell your story to the public. Here in the National Guard, we wanted to remind New Yorkers that their National Guard was part of America’s Army and an important one at that. In a nation at war for more than a decade, connecting the nation with its Soldiers is at the heart of all we communicate. It is important, I think, to show editors what the event might look like, so we used an image from our celebration in 2011 to remind them of the visual opportunity. Now take a moment and reflect on YOUR organization. What message could you fit onto a birthday cake? What milestones would you want to celebrate? How would you connect that birthday, anniversary or milestone with your stakeholders and the public? Why not have a cake? In our organization, we selected one of our most senior leaders and junior Soldiers to jointly cut the cake, representing our continuity. We included Brig. Gen. Renwick Payne, an officer with some 38 years of service, and Private Reid Frasier, a Soldier who joined our ranks 18 months ago. Both have very unique stories and perspectives for interesting interviews. Who might you want at a ceremony at your site? A senior executive? Oldest and youngest employee? Newest customer? How important is connecting your past to your present? My point is that milestones occur in all of our organizations. How we note them, celebrate them and most importantly, tell that story in a public forum can make that cake worthwhile.